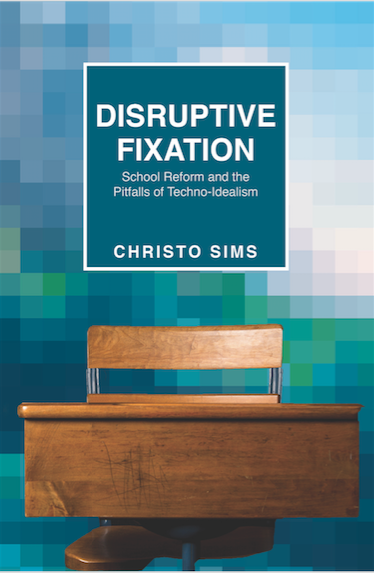 Assistant Professor Christo Sims has won the 2018 Best Book Award from the Communication, Information Technology, and Media Sociology (CITAMS) section of the American Sociological Association for his book, Disruptive Fixation: School Reform and the Pitfalls of Techno-Idealism (Princeton 2017). In New York City in 2009, a new kind of public school opened its doors to its inaugural class of middle schoolers. Conceived by a team of game designers and progressive educational reformers and backed by prominent philanthropic foundations, it promised to reinvent the classroom for the digital age. Ethnographer Christo Sims documented the life of the school from its planning stages to the graduation of its first eighth-grade class. Disruptive Fixation is his account of how this “school for digital kids,” heralded as a model of tech-driven educational reform, reverted to a more conventional type of schooling with rote learning, an emphasis on discipline, and traditional hierarchies of authority. Troubling gender and racialized class divisions also emerged. Sims shows how the philanthropic possibilities of new media technologies are repeatedly idealized even though actual interventions routinely fall short of the desired outcomes—often dramatically so. He traces the complex processes by which idealistic tech-reform perennially takes root, unsettles the worlds into which it intervenes, and eventually stabilizes in ways that remake and extend many of the social predicaments reformers hope to fix. Sims offers a nuanced look at the roles that powerful elites, experts, the media, and the intended beneficiaries of reform—in this case, the students and their parents—play in perpetuating the cycle. Disruptive Fixation offers a timely examination of techno-philanthropism and the yearnings and dilemmas it seeks to address, revealing what failed interventions do manage to accomplish—and for whom.